While the Marvel Cinematic Universe continues to ride the line between average family fun and innovative action blockbuster, the small screen efforts of Marvel take chances and work hard to challenge their viewers on an intellectual level. 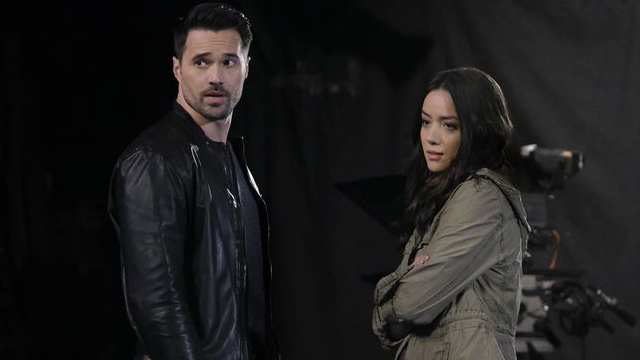 While still a popular show, Marvel’s Agents of S.H.I.E.L.D. is the bottom of the totem pole in popularity. It isn’t as hip as Luke Cage, visceral as Daredevil, emotionally complex as Jessica Jones or as readily available as Iron Fist (even though I am a fan of that series). AoS has taken the framework (no pun intended) of The X Files and has used it as a catalyst to expand on the Marvel Universe and explore all aspects that Marvel has to offer, from the vast ends of the universe, to the depths of Hell. We no longer live in the Star Trek age when you got 26 episodes in a row. We now live in the age of the “mid-season break”. Basically, we get 2 shortened seasons of the full 26 broken up into 2 parts of the year. The first half of this season dealt with Ghost Rider and a more horror/fantasy theme that covers redemption, responsibility and choices; while the second season has a classic science fiction motif, with themes of creation and paranoia, with AIDA and the convergence of AI and the supernatural Darkhold. Agents has remained consistently creative in it’s writing and how organically it weaves its large story arcs together. It really is quite a large scale show, considering how relatively humble it feels at times. Unlike Daredevil or Jessica Jones, which play out like adult dramas akin to Game of Thrones or Breaking Bad, Agents unfolds like a comic book. The stakes are high, the melodrama can be moody, the action services the plot to satisfy the audience, but at the same time it has humility and sense of accessibility, which is the hallmark of Marvel. It isn’t meant to make you fell miserable, even though in this portion of this season, the characters are in a pretty low point. This is, most likely, in part to the involvement of Joss Whedon, even though his brother and sister in law are holding the reins. This week’s “All the Madame’s Men” continues the arc of our main players in a computer simulation like the episode of The X Files “First Person Shooter”. This is one of the more creative ideas implemented into a series because it allows our cast to do some acting and get out of their comfort zone. The pieces are on the board and the game is a foot. Daisy and Jemma need to help the gang escape, while AIDA fights back as if the Agents are a computer virus. AIDA is a compelling villain because she isn’t another revenge monster with a doomsday machine, and just wants what every robot wants, which is to be alive. Her goal is pretty much the same as Robin Williams’ character from Bicentennial Man. Joking aside, AIDA has created an ingenious labyrinth for the Agents to navigate through. She is the puppet master and this is the first villain the Agents have faced that has complete dominance over them. The Agents have been manipulated and you can bet your sweet buns that whoever snaps out of this digital stupor will have to live with what they’ve done in this virtual prison. This episode was a fine addition to the series and is helping it chug along at a brisk pace. In all honesty, this show isn’t showing any signs of running out of steam, because it doesn’t burn much energy to begin with. It does have a full 20+ episode season, so this thing needs to keep the viewers interested. I’m still hanging on, and I think this show continues to deliver. The best way to sum it up is that Daredevil is an Audi TT and Agents of S.H.I.E.L.D. is a Prius. It’s perfectly fine, but some people may want a little more horsepower. I had one problem with this episode, and it was a shot at our current establishment. Whether you care about current politics/our Presidential cabinet, I believe entertainment like this should serve as an escape from the real world. Sure, social commentary is acceptable, but this isn’t CNN or FOX News, so let’s leave these kinds of biased politics for the news networks. I’ll give it that it does end with a pretty great monologue from Coulson, but, as always, he is what keeps the show running.